Wow, didn't even realize his last was 15-0 as well. Thought I had scanned back through all the 15-day tournaments. Still prior to the 6/year format though. Guess he's the record unless you want to * it or something. Still curious to see if he can pass Chiyonofuji's mark. If my datebase scanning is accurate (do add if I overlooked someone), oldest zensho is Chiyonofuji at 34 years, 3 months, 24 days (b. June 1, 1955, 15-0 September 24, 1989). Hakuho second with 33 years, 6 months, 13 days (b. March 11, 1985, 15-0 September 23, 2018). Can he post a perfect record Nagoya 2019 or later? Unfortunately, Oosunaarashi is no longer a currently active rikishi with kinboshi. Anyone know the origin of the term? 飛び makes sense, but searching 八艘 in the dictionary only brought up やそうとび (yasoutobi instead of ha-?) and nothing else. So you're telling me Tochinoshin and Kakuryu are the wrestlers that aren't injured? Hattorizakura ends his losing streak. Maybe his chest waxing ran late? Not sure what else that'd be. They'll have to have more than two, since the current ones both KK'd and Terunofuji is getting demoted. Possible to force your way up to extra one as well, but pretty unlikely. I think the last was Kakuryu going 12-3 from Komusubi, while Kotoshogiku (10) and Kisenosato (8) were holding down the usual spots. The 新 shin as in new, like shin-Ozeki Takayasu, etc (not 心 like Tochinoshin). Following demotion, Kotooshu went 8-7, 1-9 and retired. Konishiki went 2-13... then spent another 23 basho (none higher than M3) before hanging it up. I see nothing wrong with either decision, if that's what they want. Didn't stop him from participating in the end of this basho. and who knows how well the injury will be doing by early May? -Why is using a henka on the guy voted "most likely to fall for a blatant henka" suddenly considered clever? It seems more like common sense, if you're desperate enough to care about nothing but beating 'Giku. (Although I have a hard time imagining he loses that straight up, and Kise clearly isn't fit to fight anymore, so I don't know what he could be so desperate? for.) 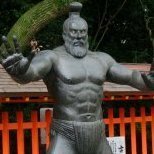 -I have to wonder if Terunofuji would have still used the henka had Kisenosato withdrawn and completely handed the title over instead of theoretically staying in the running. -Anyone else kind of hoping for a Kisenosato henka? Probably wouldn't work too well (once, much less twice), but I doubt straight-"forward" sumo (or just walking backwards out of the ring) will do him much good regardless.